ACRN – pronounced “acorn” – is an open source reference hypervisor with a small footprint, real-time capabilities, adaptability with support for Linux, Android, and RTOS guest operating systems, built for safety critical code in mind, and specifically designed for IoT and embedded devices. The project is managed / supported by the Linux Foundation. Two main components: the hypervisor itself, and its device model complete with rich I/O mediators managed by Linux-based Service OS (SOS). Small footprint – Approx. 25K lines of code (LOC) for ACRN hypervisor against 156K LOC for datacenter-centric hypervisors. The project is open source with a permissive BSD license, and with the code and documentation available on Github. 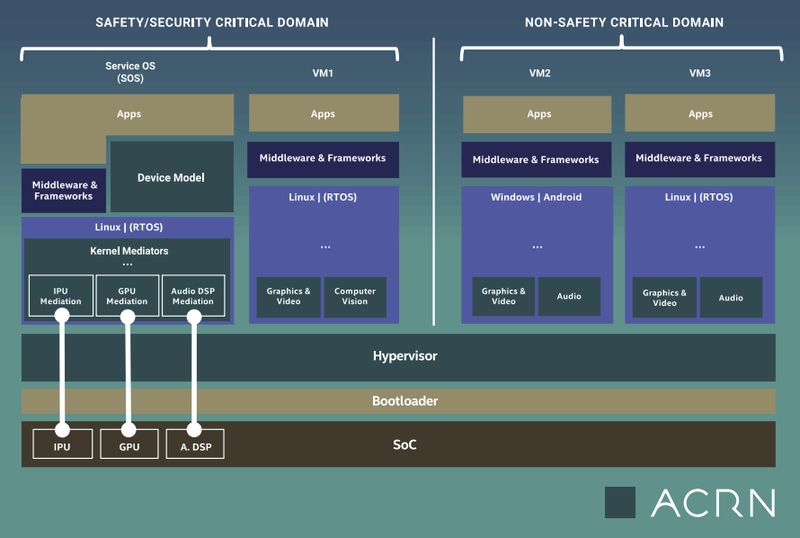 Currently, the solutions seems especially suited for automotive solutions, as ACRN type-1 reference hypervisor is said to be suitable for building software defined cockpit (SDC) or In-Vehicle Experience (IVE) solutions running on Intel Architecture Apollo Lake platforms. More details can also be read on the project page.